Performs a wipe transition between two input clips using a growing or shrinking rectangle. The Wipe Amount parameter should be animated to control the transition speed. Increase the Border Width parameter to draw a border at the wipe transition edges. Wipe Direction: Popup menu, Default: Rect In . The direction of the rectangle wipe. Rect In: the rectangle contains the first image and shrinks inwards. Rect Out: the rectangle contains the second image and grows outwards. The rotation angle of the rectangle in counter-clockwise degrees. Rel Width: Default: 1.25, Range: 0.02 or greater. 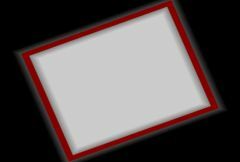 The relative width of the rectangle. Increase to make wider, decrease to make thinner. The location of the rectangle center in screen coordinates relative to the center of the frame. Note that moving the rectangle center can also cause the rectangle size to change so that the current value of Wipe Amt remains correct.